Israeli forces continued with systematic crimes, in the occupied Palestinian territory (oPt), for the week of 31 January – 06 February, 2019. Israeli forces continued to use excessive force against the peaceful protestors in the Gaza Strip and West Bank. A Palestinian civilian succumbed to his wound while participating in a protest organized in Zikim” military base. 100 civilians, including 29 children, 3 women, a journalist, and a female paramedic, were wounded. 9 civilians were wounded in the West Bank. A Palestinian civilian were killed and a child was wounded near a military checkpoint in the northern West Bank, under the pretext of throwing a homemade pipe bomb at the soldiers. 7 Palestinian civilians, including 2 children, were wounded in separate incidents in the West Bank. 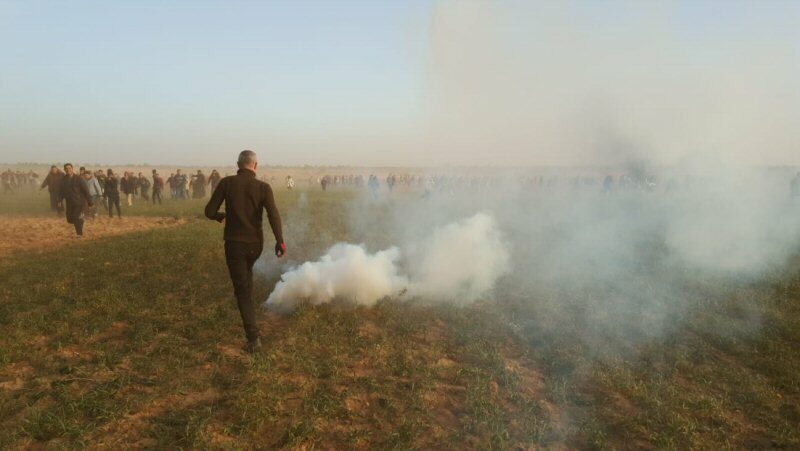 In the Gaza Strip, the Israeli forces continued to use lethal force against the participants in the peaceful protests organized along the Gaza Strip borders, which witnessed the peaceful protests for the 45th week along the eastern and northern border area of the Gaza Strip. They also continued to use armed force as well during the incursions into the West Bank. In the Gaza Strip, the Israeli forces wounded 100 civilians, including 29 children, 3 women, a journalist, and a female paramedic. The injury of 7 of them was reported serious. In the West Bank, Israeli forces killed a Palestinian civilian on 04 February 2019, and wounded another one accompanying him at a military checkpoint in the north of the West Bank. The Israeli forces claimed that a homemade pipe bomb was thrown at the soldiers stationed at the checkpoint. Moreover, the Israeli forces wounded 15 civilians, including 3 children, in separate incidents in the West Bank. On 03 February 2019, medical sources at al-Shifa Hospital declared the death of Ahmed Abu Jabal (29), from al-Shuja’iyia neighborhood, east of the city, after he succumbed to his wound. Ahmed was hit with a live bullet to the legs on 29 January 2019 while participating in a protest organized in Zikim” military base, northwest of Beit Lahia in the northern Gaza Strip. As part of targeting the Palestinian fishermen in the sea, the Israeli forces continued to escalate their attacks against the Palestinian fishermen, indicating the on-going Israeli policy to target their livelihoods. During the reporting period, PCHR documented 2 incidents were as follows: 1 incident adjacent to Khan Yunis Shore and 1 incident adjacent to Rafah Shore. As part of targeting the border areas, Israeli forces stationed along the border fence with Israel, opened fire 5 times at lands located in the border areas with Israel in the central of Gaza Strip and southern Gaza Strip. No casualties were reported. Moreover, the Israeli tanks targeted 2 military sites with artillery shells in eastern Khan Yunis. During the reporting period, Israeli forces conducted at least 79 military incursions into Palestinian communities in the West Bank. During those incursions, Israeli forces arrested at least 56 Palestinians, including 14 children and a woman. In the Gaza Strip, the Israeli forces conducted 3 limited incursions in eastern Gaza Strip. In the Gaza Strip, on 01 February 2019, Israeli vehicles moved around 100 meters into the east of al-Qararah village, northeast of Khan Yunis, south of the Gaza Strip. They levelled and combed the lands along the border fence with Israel. On 04 February 2019, Israeli vehicles moved around 100 meters into the east of the border fence with Israel, east of Dir al-Balah. The Israeli vehicles levelled and combed lands along the border fence. On the next day, the Israeli vehicles recurred the incursion, leveled lands and combed the area. As part of the Israeli house demolitions and notices, on 01 February 2019, Mahmoud Abu Hussein started to demolish his house in al-Mukaber Mount, south of occupied East Jerusalem, after Israeli municipality handed him a notice to self-demolish the house under the pretext of non-licensing. The 120-square-meter house sheltered 3 families of 13 members, including 7 children, and it was a building attached to a 100-square-meter older building. On 02 February 2019, Majdy Abu Teyeh started to demolish his house in Silwan village, south of occupied East Jerusalem’s Old City, after the Israeli municipality handed him a notice to self-demolish the two rooms under the pretext of non-licensing. The 70-square-meter house sheltered a family of 6 members, including 4 children. As part of the Israeli settlers’ attacks against the Palestinians civilians and their property, on 01 February 2019, a group of 7 settlers stepped out of their car and attacked a group of Palestinian young men while walking in Jibiya village forests, on “al-Qimma Park” Street, northeast of Ramallah. The settlers severely beat Aram Wadee’ Hussein ‘Awees (18), so he sustained bruises in his face and throughout his body. On 05 February 2019, a group of settlers, from “Ma’un” settlement, established on civilian’s lands, east of Yatta, south of Hebron, uprooted 23 olive seedlings planted a month ago in a land belonging to Jom’a Moussa Rab’ee (45), in al-Hamra area. ‘Abed al-Rahman Hani ‘Abed al-Qader al-Kahlout (22), a freelance journalist, who was hit with a tear gas canister at the shoulder. Northern Gaza Strip: The Israeli shooting at Palestinian demonstrators resulted in the injury of 25 civilians, including 7 children and a woman. 13 of them were hit with live bullets and shrapnel and 12 were directly hit with tear gas canisters. The wounded civilians were then taken to the Gaza European Hospital and al-‘Awda Hospital via an ambulance belonging to the Palestinian Red Crescent Society (PRCS) and Union of Health Work Committees (UHWC). The injury of 3 of them were reported serious. Central Gaza Strip: The Israeli shooting at Palestinian demonstrators, which continued until 17:30, in the injury of 14 civilians, including 7 children and a woman. 5 of them were hit with live bullets and 9 were directly hit with tear gas canisters. Khan Yunis: The Israeli shooting at Palestinian demonstrators, which continued until 17:30, resulted in the injury of 15 civilians, including 11 children. The injury of 2 of them, including a 17-year-old girl, was reported serious as they were hit with a live bullet to the chest. Rafah: The Israeli shooting at Palestinian demonstrators, which continued until 17:00, resulted in the injury of 19 civilians, including 3 children and a female paramedic. 11 of them were hit with live bullets and shrapnel and 8 were directly hit with tear gas canisters. The injury of 2 of them were reported serious. The wounded paramedic was identified as Eman Mostafa Hammad Abu Sha’ar (30). Eman is a volunteer paramedic at the Ministry of Health and she was hit with a tear gas canister to the right ear. At approximately 16:45 on Sunday, 03 February 2019, medical resources at al-Shifa Hospital declared the death of Ahmed Ghazi ‘Abbas Abu Jabal (29), from al-Shuja’iyia neighborhood, east of the Gaza Strip. Ahmed succumbed to wounds he sustained on 29 January 2019 while participating in the protests organized in Zikim” military base, northwest of Beit Lahia in the northern Gaza Strip. Ahmed was hit with a live bullet to the leg caused a cut in the veins. Due to hos serious health condition, Ahmed was then referred to al-Shifa Hospital and stayed there until his death was declared. Following the Friday prayer, on 01 February 2019, dozens of Palestinian young men, from al-Moghair village, northeast of Ramllah, headed to al-Sahel Mount area, adjacent to 60 settlement road from the northern side, to protest at confiscating and seizing their lands by the Israeli settlers. When the protestors arrived at the mentioned area, the Israeli forces fired live bullets, rubber bullets and sound bombs at them. As a result, 7 civilians were wounded. 6 of them were hit with live bullets and another one was hit with a rubber bullet to the thigh. The wounded civilians were taken to the Palestine Medical Complex via a PRCS ambulance. After they received first aid at the Emergency Department, they were referred to the Specialist Hospital in al-Rihan suburb, north of the city. Medical sources said to PCHR’s fieldworker that the injury of them were described between minor and moderate. At approximately 13:00 on Friday, a peaceful demonstration started from the center of Kafur Qaddoum village, northeast of Qalqiliyia, and then headed towards the eastern entrance to the village, which was closed 15 years ago in favor of “Kedumim” settlement. The demonstrators chanted national slogans calling for ending occupation and condemning the Israeli forces‘ crimes committed against Palestinian civilians in the Gaza Strip. The demonstrators threw stones at the Israeli soldiers stationed behind sand berms. The Israeli soldiers fired sound bombs, rubber bullets and tear gas canisters at them. As a result, 2 civilians were hit with rubber bullets; one of them were hit to the shoulder while the second one was hit to left hand. The injury of them was reported minor. They received medical treatment on the spot by the staff of the Palestinian Red Crescent Society (PRCS). On Friday morning, 01 February 2019, Mahmoud Abu Hussein started to demolish his house in al-Mukaber Mount, south of occupied East Jerusalem, after Israeli municipality handed him a notice to self-demolish the house under the pretext of non-licensing. The 120-square-meter house sheltered 3 families of 13 members, including 7 children, and it was a building attached to a 100-square-meter older building. It should be mentioned that Mahmoud is still paying a fee of NIS 35,000 for the older building under the pretext of non-licensing as well. On Saturday morning, 02 February 2019, Majdy Abu Teyeh started to demolish his house in Silwan village, south of occupied East Jerusalem’s Old City, after the Israeli municipality handed him a notice to self-demolish the two rooms under the pretext of non-licensing. The 70-square-meter house sheltered a family of 6 members, including 4 children. It should be mentioned that Majdy is paying a fee of NIS 50,000 imposed on him by the Jerusalem Municipal Court. At approximately 10:00, on Thursday, 31 January 2019, Israeli forces leveled a road connecting between Mssafer Yatta, south of Hebron, and Khirbet Sha’b al-Batam, under the pretext that it passes through Israeli controlled areas. Khirbet Sha’b al-Batam is in Mssafer Yatta. The constructed area in Khirbet Sha’b al-Batam is 110 dunums where 9 families of 81 members, including 37 children, live in 10 accommodations of 7 tents, 3 barracks of tin plates and a caravan. At approximately 14:00 on Friday, 01 February 2019, a group of 7 settlers stepped out of their car and attacked a group of Palestinian young men while walking in Jibiya village forests, on “al-Qimma Park” Street, northeast of Ramallah. The settlers severely beat Aram Wadee’ Hussein ‘Awees (18), so he sustained bruises in his face and throughout his body. Aram fainted and was then taken to Palestine Medical Complex. He discharged 2 hours later. It should be mentioned that Aram studies Computer Science at Birzeit University. At approximately 07:30 on Monday, 04 February 2019, dozens of settlers, protected by Israeli forces, moved into Deir Dibwan village, northeast of Ramallah, and rioted on the village’s street. They wrote racist slogans against Palestinian civilians on houses walls and then withdrew. At dawn hours, on 05 February 2019, a group of settlers, from “Ma’un” settlement, established on civilian’s lands, east of Yatta, south of Hebron, uprooted 23 olive seedlings planted a month ago in a land belonging to Jom’a Moussa Rab’ee (45), in al-Hamra area. At morning hours, Israeli forces and police arrived at the area in order to prevent any settlers from approaching the land as Jom’a has a court decision that proves that al-Rab’ee family owns this land and settlers are not allowed to enter it. The aforementioned land is 500 meters away from “Ma’un” settlement. Fully detailed document available at the official website of the Palestine Centre for Human Rights (PCHR).